The safest place for your jewelry is on your neck or finger! But it is sometimes necessary to leave it at home. Is there a good place to hide your diamonds where they won't be found if thieves break into your house? Your bedroom is the first place a thief will look, according to Jewelers Mutual Insurance Company. Jewelry boxes, dresser tops and drawers, and surfaces such as the bathroom counter or kitchen sink are prime targets for thieves. Unfortunately, these are the places most of us choose to keep our jewels. Hey, those spots are convenient...but what is convenient for us is also convenient for a thief. 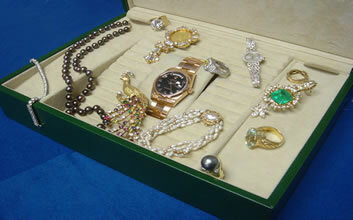 Jewelers Mutual cautions against hiding jewelry in the pockets of clothes hanging in your closet. A thief won't stop to search each garment; he will grab everything he can and check later. You also run the risk of sending your jewelry to the dry cleaners or giving it away in a box of clothing earmarked for charity. The best selling novel by Amy Tan, The Bonesetter's Daughter, includes juicy tales of hidden valuables that are most inspiring. I liked reading about the vinyl, La-Z-Boy recliner that safely hid an apple-green jade ring: a shallow cavern in the stuffing below the seat was covered by a flap and a cutting board. The jade ring, a rare photo and a Chinese Bible were secured in that hidey-hole below the seat cushion, safe for thirty-one years until they were retrieved by Our Heroine. Gold jewelry (24 karat, no doubt) was hidden in hard, hollowed-out crab apples and sewn into cuffs. A suitable home safe or bank safe-deposit box is best; next best is secure, locked immobile compartment. My aunt used a hole behind a strip of molding in her dining room; her apartment was robbed, but the jewelry was never taken. Unique and obscure, yet convenient enough for you to actually use, are the key concepts in finding a hiding spot. Remember where you hid your jewelry. Tell a trusted friend, too, because it is all too easy to forget (true story: I forgot where I hid my Rolex. It took me seven months to find it). The last caution involves travel: never pack your jewels in your luggage (luggage is lost or stolen way too often) and never leave your jewelry unattended in a hotel room. Shop around for security belts and pouches-use the hotel's security vault-and get your valuables appraised and insured.